Crockalough is the 933rd highest place in Ireland. 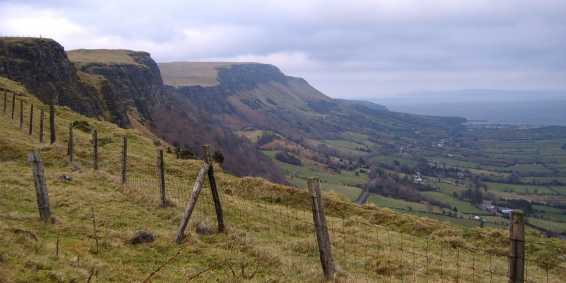 Crockalough is the highest point of the majestic upland plateau separating two of the famous Glens of Antrim - Glenariff and Glenballyemon. This visit to the plateau starts in the village of Waterfoot, parking in the handy carpark next to the beach (243255 B). Return to the main street and head for the bridge over the Glenariff river, passing a number of pubs and taking in the smell of burning turf. Turn right to follow the coast road as it skirts the sandy beach of Red Bay and take the narrow road heading uphill at 243259 C.
This is a steep narrow lane which quickly increases available views over the Irish sea, past redbay pier to the Mull of Kintyre, Ailsa Criag and the Isle of Man. Turn left at the end of this lane and follow the road uphill - just after the brow take a concrete farm lane to the left at 235262 D, heading towards a noticeble mobile phone mast. Take a stone lane to the right, which greens and climbs to a gate leading to open hillside. Negotiate a maze of high gorse to to find short cropped grass reaching to the plateau above. The views continue to widen and deepen with height. Keep to the right of the headland to pick up a fence leading steeply uphill, cross a stile and a zig zag track brings the plateau in 45 mins with 1,200 ft of climbing. An old stone wall runs along the spine of the plateau here, with sharp posts protruding, almost as if waiting for the heads of those who would defy the local chieftains. The higher Antrim hills to the N come into clear view. The walk continues on the more dramatic S side of the plateau, along the steep slopes rising from the Queen of the Glens - Glenariff. This has to be one of the best examples of a U shaped glaciated valley in the country, with lush green farmland hemmed in by dramatically steep slopes on either side. A stream is reached (220234 E) as it tumbles down into a waterfall and was just made to stop for a bite to eat. Continue to follow the edge of the escarpment as the valley below narrows to another stream (218224 F). Follow this stream back into the plateau. The stream heads for the low rise over 1 km away that is the top of Crockalough. This is over more difficult ground at times as head for the S end of the rise. Along the top there are peat hags and water to avoid. There are two distinctive little points along this top that showed 405m on my GPS so take your pick. The return is a drop and walk along the N side of the plateau which is not as inspiring. A number of dropping fencelines bar the way and my trousers bear the scars. the descent off is as the ascent, with the tide now out making the beach more picturesque.